Cliff Beard was born in 1931 in Alfreton, and in 1934 the family moved to Riddings when his father took up an engineering job at Riddings’ Forge. 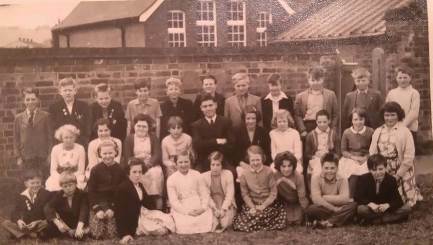 By 1939 they had moved to Wagstaff Lane, Jacksdale and Cliff transferred from Riddings Primary School to Jacksdale Council School, where he stayed till he was aged 14 years. At the time the war was on and Cliff remembers that all the teaching staff were female, as the male teachers had been called to war. Cliff was not able to go to Henry Mellish Grammar School as his father was not able to pay the fees, but he did get a place at the Pupil Teacher Training Centre in Nottingham, where he attended 3 days a week until the age of 18. The other 2 days were spent teaching in school. His first teaching position was at Matthew Holland but Cliff later moved to Jacksdale School Primary. Cliff has a treasured photograph of his class and can remember them all to this day. He says his pupils there were very capable. Cliff also taught at a primary school in Tibshelf, and was a head teacher at Giltbrook School and also at Underwood. Cliff’s father always a keen engineer, had a lathe in the cellar of their home and later went into partnership with a brother to form an engineering workshops at Pye Hill, next to Knightsbridge Garage. Cliff describes Beard Engineering as ‘a small firm with a large capacity’ working at precision levels to within microns rather than thou’s. A very clear and precise recollection, definitely worth listening to.